1980. Coventry is the centre of the music universe. 2 Tone has conquered the nation. The Specials started it all off and along with The Selecter have made it cool to be from Coventry. Along with Madness and Bad Manners they are regulars on Top of the Pops which is a sure sign you’ve hit the big time. on the back of his in red letters. I think the red letters are why I remember this. They were possibly more expensive than the normal white transfer letters too. A girl in the year below at school called Zoe had ABBA on the back of hers. I remember thinking “fair play!” as I really liked them but it wasn’t the done thing to admit liking Abba back then. The school is in Whitley, which was also home at the time to John Bradbury, the drummer from The Specials. If I remember correctly, virtually every kid in the area claimed to have met him and been given a pair of drumsticks. My older brother had all the LP’s and plenty of singles released by the groups associated with 2 Tone. The “More Specials” album is knocking about somewhere in his attic complete with the free poster. Of all the Specials tracks I think we both liked “Do Nothing” the best back then, though he did like to sing the opening lines of “Gangsters” a lot. In 1981 we were abroad on holiday when the group played their free concert at The Butts. I don’t think I would have been allowed to go but my brother would have went so was gutted to miss it. We arrived home to hear that a race riot had taken place in Coventry to accompany the full on chaos that had broken out in many big cities throughout England. Unemployment and Racism were not things that meant a lot to me at 11 years of age. That said, Skinheads were highly visible in Broadgate and were avoided at all costs. They were either NF or British Movement which apparently could be determined by counting the number of lace holes in their DM’s. Lynval Golding was famously stabbed in a racist attack that nearly cost him his life. [It happened at the club which has had various names over the years - Shades / Reflections / Bobby’s etc. - and whatever the name it was always the most notorious city centre club] Worst of all, a girl at school lost her dad in a racist murder. She was off for a long time and when she eventually returned, had (not surprisingly) a very sad and haunted look about her which I’ve never forgotten to this day. Tragedy would sometimes touch on junior school life but it was usually through kids being killed in road traffic accidents - bad enough for sure - but having your dad murdered was on another level of horribleness altogether. Over the years a full-on reunion of the group seemed like it would never happen and I think most people had resigned themselves to this. There would be 2 Tone collectives and two or maybe three of the original line up playing together from time to time or collaborations with new bands and singers who had been influenced by them, but the dream of a second coming for our City’s musical Messiah’s was just that - a dream. 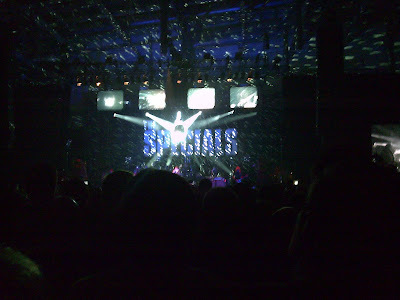 I thought the closest I would get to experiencing anything close to the magic of a Specials concert was when my younger brother (aged about 15 at the time) asked me to go and see a play at The Belgrade with him which featured live versions of their songs and was set in Coventry during those heady days. It was the last night and many ageing Skinheads were in the audience. I’ve forgotten what it was called but it was very good and at the end Pauline Black came on and sang. There was a stage invasion by the ageing baldies who stomped along with Pauline and the band. Great stuff which just fuelled my desire to see The Specials get back together. TAKE THE PINS OUT AND FEED ME JOYBERT! The Specials are coming home and the only things wrong are the weather and the venue. It’s lashing down and they are playing the Jaguar Exhibition Hall which forms part of the Ricoh Arena. I’ve seen Bryan Adams and The Enemy here before so know that the sound will not be up to scratch or as good as the other venues the band has played during the tour. Sadly, for one of the biggest cities in England, and a city with such a rich and diverse musical heritage, Coventry does not possess a purpose built 2,000-3,000 capacity venue capable of hosting a concert like this. The Exhibition Hall is basically an aircraft hangar and not designed for concerts. I’m not going to let it bother me though and I doubt many of the 8,000 strong “welcome home” party will be bothered either. I never thought we would see this day. It’s the best thing to happen to Coventry since the Sky Blues lifted the FA Cup back in 1987. Who cares if Terry Hall supports Man United and once apparently said we are a bunch of W*nkers?! Who cares if Jerry Dammers is missing from the line up? Yes, I tip my hat to you Jerry for creating The Specials and having the 2 Tone vision but you’ve messed up big time by not being part of this, yes siree! So, minus a coat, I get a bus into town then board the No. 4 at Pool Meadow. It’s still pelting down with rain so I’m going to get soaked when I get off. Upstairs we are treated to a loud discussion from a group of 14 or 15 year girls and one boy. The girl with the biggest gob uses the f-word more than Gordon Ramsey. They are drinking vodka and don’t have a lot of time for someone called Paul. Paul is going to get ‘banged’. The boy with them is a friend of Paul, yeah. He doesn’t realise Paul has ‘banged’ (as in punching) a girl, yeah. He is not impressed, yeah, and is not going to look out for Paul anymore, yeah. Some tinny music from a mobile phone is then shared with us. It’s some kind of urban vibe that I’d associate with America. The boy then tells some tale about his last appearance in court. My solicitor was no good, yeah, so I stood up and spoke for myself, yeah. I told the magistrates I had done well, yeah, and this was a relapse but I couldn’t be expected to change completely straight away, yeah, and you should give me one more chance, yeah. If I’m up before you again, yeah, just send me to prison. He then told the girls he was a “criminal from Holbrooks” or something like that. They get off the bus with one of the girls saying that her mum is babysitting her child tonight. Too much too young indeed. I and some other Ricoh bound punters get off a few stops after them. I console myself that I’m not the only one going to get drenched as two of them just have t-shirts on as well. Under the railway bridge some ticket touts from up north ask if I have any spare tickets. “I wish I had mate!” I reply as a jog past. The jogging was a waste of time. I was soaked on arrival but wasn’t bothered. Once I’d been scanned with a hand held metal detector and sniffed for drugs by a dog I enter the aircraft hangar. It’s pretty full already and everyone else is dry. After a little walk around and trip to the loo I take up position near the mixing desk where Terry Hall’s son and A.N.Other are the D.J.’s for the night. It’s fairly central to the stage and not too far from the front so I won’t be in the thick of it but will have a good view. Now to kill time. “D.J. Phoenix” (I later learn it is D.J. Felix) and A.N. Other entertain us with reggae tunes etc. until support act The Ripps appear. I’m shocked to see Rachel the smiling drummer is no longer with them. To me she was a vital part of the band. I’ve kept a sporadic eye on them since seeing them at the Godiva festival a few years ago. Sadly they don’t seem to be heading anywhere fast despite being tipped to hit the dizzy heights once upon a time. Most of the set is excruciating and not suited to what the audience wants to hear. Not their fault of course and it can’t be easy playing to a disinterested audience who are mainly 35+ years. A brass section appears and they redeem themselves a bit with the final few numbers which have a slight ska tinge to them. I’ve heard “Daddy Was A Hero” on their MySpace page ages ago and really like it so it was nice to see them do it live. The applause at the end of the set is much better than it was for the first three quarters of it. Back to the reggae and ska music. I scan the audience. Pockets of ageing Skinheads, many of which must have come of retirement just for tonight, are dotted about all over the place. Quite a few look a lot tougher than the security staff in the place! Many couples are here. People dressed in 2 Tone clobber and hats. Youngsters, though outnumbered, have also turned out in force. Human beings of all shapes, sizes, creeds and colours are here. It amuses me to see families and some tame looking couples heading towards the front. Surely they don’t expect people will be standing like statues and politely applauding when the band is in full flow? The DJ’s continue to try and whip the crowd up. “The Liquidator” doesn’t get much response but “Geno” does. Eventually they announce that The Specials will be on in three minutes and the brilliant opening arrangement begins. I’ve watched it on YouTube so many times at the other venues and think it has to be best way to kick things off ever! Sure enough the crowd sings along to “Enjoy Yourself”, a sea of mobile phones are held up, the curtain drops and The Specials burst into “Do The Dog”. Superb. I’m not going to review the set as it’s easy enough to watch every song from it on YouTube, be it in Newcastle, Glasgow, Sheffield, Manchester, Birmingham, London or Cov. Suffice to say I was bouncing like mad and knackered after a couple of songs! (Which I suspect was the case for a lot of the audience!) Sure enough, the families and tame couples soon beat a hasty retreat from the front to slightly less energetic parts of the venue. Only slightly less mind you as virtually everyone in the building was dancing. Half way through the set the hearing in my left ear was pretty much shot and things weren’t helped by the poor acoustics. Much of the stage banter was inaudible but I did catch Terry Hall intimating that Lynval Golding was possibly a bit merry. Horace Panter said “Thank you for making some old men happy.” No Horace, thank you and thank you to the rest of the band and all that have made this wonderful night happen! All of them were genuinely happy up there and the absence of Jerry Dammers wasn’t felt as the keyboard player is every bit as good. Of all the songs, "Concrete Jungle" was probably the weakest as Roddy Radiation’s vocals aren’t the best. On a night like this I’ll forgive anything though and it’s his song so who am I to argue? The concert ends and I head back out into a wet and cold Coventry night. The T-shirt sellers outside have reduced prices to £5 but I don’t bother. I don’t need a t-shirt to remind me about this night of nights, it is burned into that most precious part of my memory bank - the part where my son comes into this cruel world at Walsgrave hospital, the part where Killer lifts the cup at Wembley, the part where I’m telling my dad to let go but he’s already let go and I am riding on two wheels for the first time, the part where I’m standing alongside Ian Wallace and having my picture taken with the Sky Blues, the part where Paula C. and I are doing it as quietly as we can and hoping my mum doesn’t disturb us ... okay, let’s not go there! I’m getting carried away but you catch the drift. really great write up. i did the review for Birmingham Live and couldn't praise them enough. Because i do a lot of reviews, i have bought some ear protection. now every gig is cystal clear. i used to have ringing in my ears for days after (now i can hear it all the time), but these earplugs reduce the db's without effecting the sound. i recommend them totally, but they're not cheap. Cheers Alan. Just read your review on Brum Live - great stuff! I too hope they don't turn into Status Quo and this tour will be the last. Will keep it in mind about the earplugs. Did you know that Mgcash will pay you an average of $0.50 per uploaded file download? Did you know that you can generate money by locking special sections of your blog or website? All you need to do is join AdWorkMedia and use their Content Locking plugin.